Tubers were the talk of the town in Cusco, Peru during the week of May 27, when the 10th World Potato Congress (WPC) and the 28th Congress of the Latin American Potato Association (ALAP) were held together for the first time. The event drew more than 800 participants from 50 countries to the potato’s center of origin for four days of scientific presentations, networking, field trips and celebration of the potato’s cultural and economic importance. The WPC is the most important international event for potato scientists and businesses. It is held every three years in a different country and is organized by the non-profit World Potato Congress Inc. and local partners. The 10th WPC was organized by Peru’s National Institute for Agricultural Innovation (INIA) – part of the Ministry of Agriculture and Irrigation (MINAGRI) – in collaboration with the International Potato Center (CIP), the National Agrarian University La Molina, Peru’s Ministry of Foreign Trade and Tourism and the Peru country office of the UN Food and Agricultural Organization FAO. Dr. Oscar Ortiz, CIP’s Deputy Director General for Research and Development, noted that CIP played a prominent role in 10th WPC’s organization, participating in the scientific committee and arranging logistics among other things. More than 30 CIP researchers also gave presentations or chaired panels in the varied plenaries and technical sessions of the three-day event, or presented posters on their research. 2018 marked the first time that the WPC took place in Latin America, which allowed for it to be held in conjunction with the ALAP Congress. 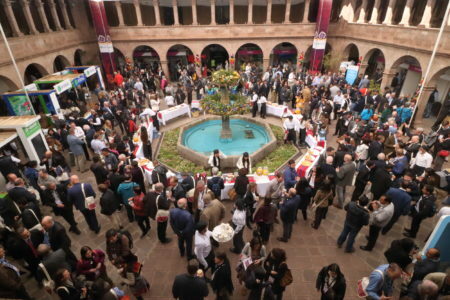 The combined congresses took place in the Cusco Convention Center from May 27—31 and included plenary speeches by a list of experts that included Dr. David Nowell, FAO Agricultural Officer for Latin America and the Caribbean; Dr. Marco Bindi, of the University of Florence, Italy; Dr. Glenn Bryan, of the James Hutton Institute, UK; and CIP Director General Dr. Barbara Wells. Potato experts from around the world participated in technical sessions covering seven themes: climate change and potato agri-food systems; trends in consumption and markets; variety development and biotechnology; pests and diseases; crop management; post-harvest and processing technology; and potato diversity and its relation to breeding, nutrition and health. Farmer Marcelo Tiza (L), President of AGUAPAN, with Graham Thiele (R), Director of the CGIAR Research Program on Roots, Tubers and Bananas. . The best presentation in each of those themes was given an award, three of which were bestowed on CIP scientists. Dr. David Ellis, the head of the CIP Genebank, was recognized for his presentation “Towards an Increased Understanding of Genetic Relatedness in Cultivated Potato,” in which he described the results of genotyping CIP’s entire collection of potato germplasm and their implications for improving potato taxonomy. Entomologist Jürgen Kroschel won an award for his presentation on research by CIP scientists to predict how climate change will affect the risk of crop loss to potato pests in the Andes in the coming decades. And agricultural economist Graham Thiele, Director of the CGIAR Research Program on Roots, Tubers and Banana (RTB), outlined evidence of climate-smart, sustainable agriculture practices in the Andes during the pre-Columbian empires of the Wari and Inca – such as terracing to improve soil and water management – and connected them to the need for a second agricultural revolution in the 21st century to help Andean farmers cope with climate change. While the technical sessions and plenary presentations make the WPC and ALAP Congress must-attend events for potato scientists, CIP and RTB wanted to provide an opportunity for Peruvian students in agricultural sciences to experience the event. They consequently created a scholarship fund and sent out a call for applications to Peru’s top universities. A total of 15 students and recent graduates from seven Peruvian universities were awarded scholarships, which covered their registration fees and travel expenses, providing them with an unforgettable week of exposure to the cutting edge of potato science. In addition to the vast array of scientific knowledge shared during the week of WPC 2018, the two congresses and associated events generated significant interest across Peru and enjoyed ample participation by government officials. The evening of May 27, a welcome cocktail was offered for participants in the courtyard of Coricancha, a former Incan Temple of the Sun that the Spanish conquerors converted into a Catholic church. In addition to WPC organizers and participants, the event was attended by Peru’s First Vice President, Mercedes Aráoz, and Minister of Agriculture and Irrigation, Gustavo Mostajo. WPC 2018 was inaugurated the morning of May 28 by the President of Peru, Martín Vizcarra, who was accompanied Aráoz, Mostajo, INIA director Miguel Barandiaran, the president of Cusco region, Edwin Licona, and the mayor of Cusco, Carlos Moscoso. Vice president Aráoz later visited CIP’s booth in the convention center, whereas Minister Mostajo convened a meeting of ministers and high-level officials from the agriculture ministries of Bolivia, Colombia and Ecuador to discuss regional cooperation to strengthen native potato conservation and farming in the Andes. Ambassador Kenneth M. Quinn, President of the World Food Prize Foundation, gave an inspiring speech. 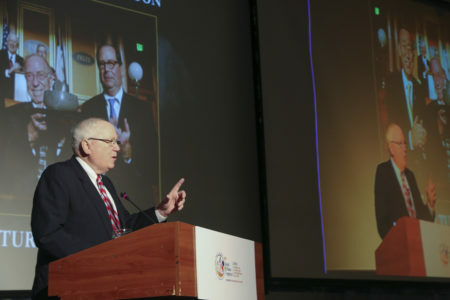 The second day of WPC 2018 began with an inspiring speech by Ambassador Kenneth M. Quinn, President of the World Food Prize Foundation, who called on participants to rise to the challenge of feeding the more than nine million people who will inhabit the Earth by 2050. This was followed by a plenary session chaired by Peru’s Vice Minister of Agriculture, Juan Risi. It began with a presentation by Máximo Torero, the World Bank’s Executive Director for Argentina, Bolivia, Chile, Paraguay, Peru and Uruguay, who outlined the potato market’s potential and the major constraints faced by developing countries. 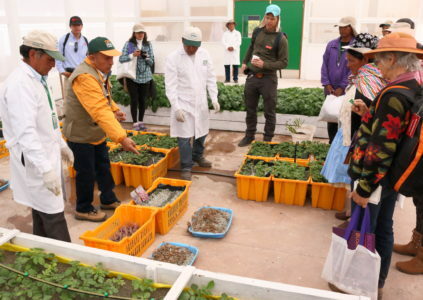 CIP researchers André Devaux and Miguel Ordinola then presented their experiences with innovations for harnessing Peru’s extraordinary potato biodiversity to improve food security, nutrition and incomes. Day two of the WPC also marked the beginning of the “Imagine a World without Potatoes” campaign, through which CIP will partner with businesses to raise awareness of the potato’s importance and generate greater demand for it. The campaign launch brought together representatives of agricultural businesses and other organizations who listened to presentations by Vice President Aráoz, Joaquín Lozano, the International Fund for Agricultural Development (IFAD) Director for Latin America and the Caribbean; Cedric Porter, Editor of the World Potato Markets Bulletin; and Romain Cools, President of WPC Inc., among others. The speakers and audience members alike enthused about the campaign’s potential for improving the potato’s image globally. WPC 2018 officially ended the evening of May 29 with the awards session and the announcement that the 11th World Potato Congress will be held in Ireland in 2021. The completion of the 10th WPC was celebrated that night with a cocktail party at the San Francisco Church and Convent, a seventeenth-century monument packed with Spanish colonial artwork. That event included a ceremony in which the WPC, MINAGRI and INIA presented CIP agronomist Alberto Salas with an award for his decades of work collecting samples of the potato’s wild relatives across the Americas for conservation in the CIP Genebank and use by potato breeders. A posthumous award was also given to the brother of Carlos Ochoa, who worked for CIP during the 1970s and ‘80s and authored various books about the potato varieties and their wild relatives in South America. Though the 10th WPC ended on May 29, the knowledge sharing continued the next morning in the workshops of the 28th ALAP Congress, with presentations covering recent developments in potato late blight management, in situ conservation and value chains for small farmers and culinary innovations. The latter workshop included a cooking demonstration by Virgilio Martínez – who was voted the world’s best chef in 2017 – and a discussion of how Peru’s gastronomic boom can be harnessed to improve the lives in the country’s indigenous potato farmers. As the experts spoke, dozens of local farmers offered shoppers native potatoes at stands on Plaza Regocijo, in front of the Cuzco Convention Center, at a Fair of Peru’s Native Potato Biodiversity organized by MINAGRI in celebration of National Potato Day. While shoppers purchased potatoes to the sound of folk music on the plaza, ALAP members convened inside the convention center in the afternoon for the Association’s bi-annual meeting, in which CIP potato breeder Elisa Salas was reelected President of ALAP for a second two-year term. 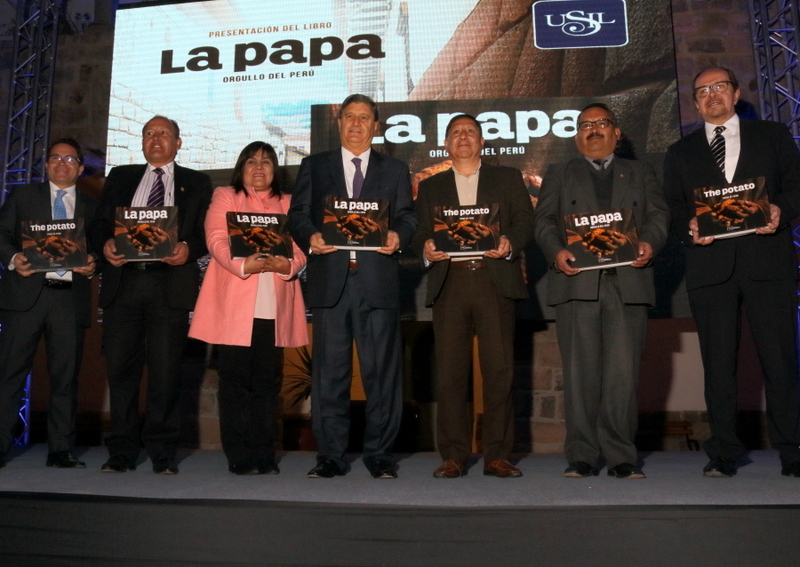 The book “The Potato: Pride of Peru.” published by San Ignacio de Loyola University (USIL), was released at an event the night of May 25. In addition to the activities of the WPC and ALAP Congress, other organizations held side events that generated more interest in the potato. The first one was the release of the book “The Potato: Pride of Peru” published by San Ignacio de Loyola University (USIL for its name in Spanish). 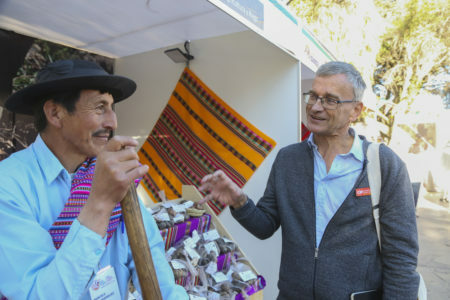 Former Vice President Raúl Diez Canseco joined the book’s authors for the May 25 event, which was held in the courtyard of USIL’s colonial building in the heart of historic Cusco. Miguel Ordinola, who wrote the book’s introduction, noted that by highlighting Peru’s native potatoes, such publications can boost demand, and thus benefit the smallholder farmers who grow them. On Sunday, May 27, scientists from across the Americas gathered in Cusco for a meeting of the Latin American Network for Late Blight Research, know as the Red Tizón Latino. This was the third meeting of the Red Tizón Latino, which was founded in Bogotá, Colombia in 2014 to coordinate research on that crop disease at a regional level, and was modeled after the European research network EuroBlight. That same day, students and professors from USIL’s School of Hotel Administration, Tourism and Gastronomy set a Guinness World Record by preparing the world’s biggest causa – a popular Peruvian appetizer made of mashed potatoes seasoned with lime juice and yellow peppers layered over a filling of vegetables and mayonnaise. The 590-kg, 1.5-meter causa was prepared, displayed, and devoured by an eager public on the campus of Cusco’s San Antonio de Abad National University. On Wednesday night, May 30, Vice President Aráoz hosted a dinner together with Marie Haga, Executive Director of the Crop Trust, for a select group of business leaders and representatives of international organizations. 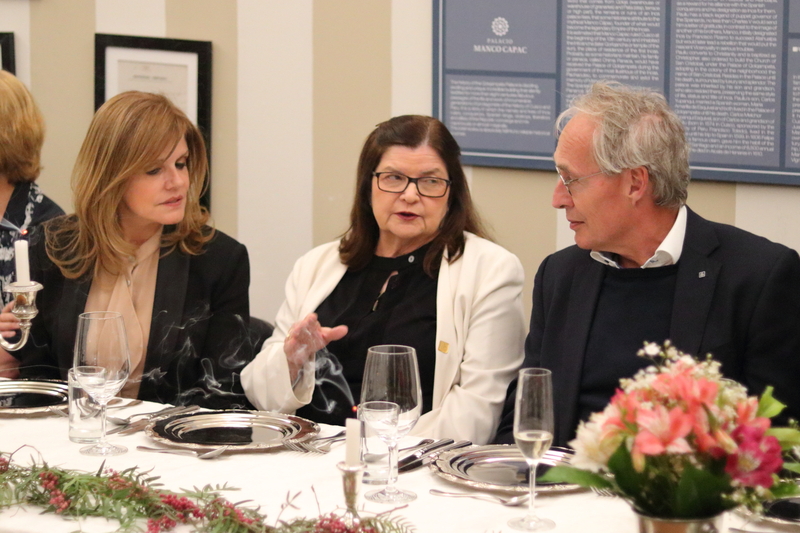 The dinner was part of the Food Forever Initiative, an international effort to raise awareness of the urgency of conserving crop and livestock diversity, and was specifically aimed at gaining business sector support for preserving potato biodiversity. CIP Director General Dr. Barbara Wells attended the dinner, together with Executive Officer Amalia Perochena and Genebank Head David Ellis. Dr. Wells took advantage of the occasion to tell the other guests about CIP’s history of conserving potato biodiversity, and its interest in partnering with businesses. CIP agronomist Carlos Chuquillanqui and INIA researchers show visitors appropriate seed production technologies at that Andenes Experimental Station. The presentations, posters and workshops of the WPC 2018 and ALAP Congress were complemented by a field day on May 31, when congress participants had the opportunity to join one of the two trips organized to sites known for their potato conservation and research: the Potato Park and INIA’s Andenes Experimental Station. The Potato Park is a collaboration of six indigenous farming communities and the Peruvian non-profit ANDES Association dedicated to in situ preservation, participatory research and the sustainable use of approximately 1,400 native potato landraces. Those who visited the Potato Park experienced the crop’s biological and cultural significance for rural Peruvians first hand, toured a community-managed genebank and seedbank, and admired fields of native potatoes surrounded by spectacular mountain landscapes. INIA’s Andenes Experimental Station comprises 33 agricultural terraces supported by stone walls that were constructed by the Incas. The field day consisted of 20 exhibits scattered across two of those terraces, where scientists from INIA and CIP provided field and greenhouse demonstrations on subjects that included native potato biodiversity; crop wild relatives; efforts to breed more resilient, high yielding, nutritional and climate-smart varieties; seed potato production technologies; and tools to improve the detection and management of potato late blight, among other themes. 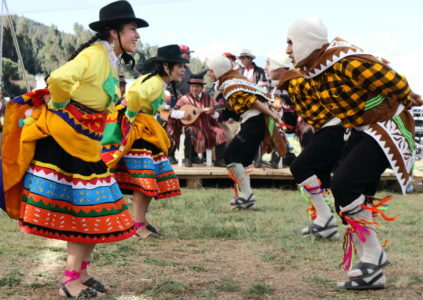 The field days included a traditional “pachmanca” lunch and Andean music and folk dancing. Both field days included a traditional Andean lunch called pachamanca: a combination of meats, potatoes, sweetpotatoes, lima beans, corn and local herbs roasted on a bed of red-hot stones while buried in the ground. That emblematic Andean dish was accompanied by Peruvian folk music, dances and ceremonies performed by local people in traditional dress. The scientific presentations and networking that constituted the main focus of the WPC and ALAP Congress thus culminated with a reminder of Peru’s extraordinary potato biodiversity and the crop’s historic and cultural importance for the people of the Andes. Congress participants were fortunate to be able to spend time near the area where the first tubers were domesticated nearly 10,000 years ago, and where local farmers preserve potato genetic diversity that could hold the key to ensuring the food security and livelihoods of people around the world for millennia to come. For more photos of WPC 2018 and related activities, visit our flickr stream.